Photo © Jackie Snow for Wilder Quarterly, used with permission. This article was originally published in February 2012. 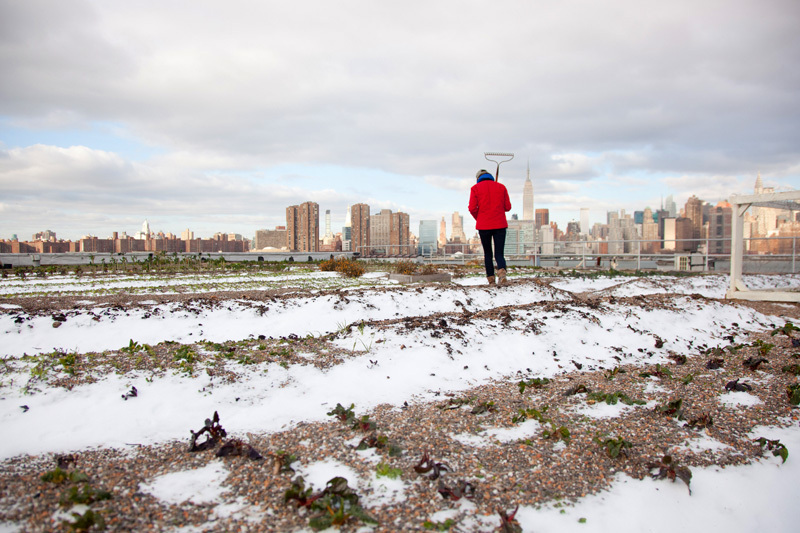 Rooftop farming during the winter may seem like a bleak prospect, but Annie Novak of Eagle Street Rooftop Farm in Greenpoint, Brooklyn says that winter on a farm is far from fallow. In the Wilder Quarterly, a Brooklyn-based magazine geared toward contemporary gardeners and growers, Novak shares the details of wintery urban agriculture while reflecting on the struggles she and other farmers faced over 2012 because of 2011’s rough weather. Farmers harvest crops through December, when kale, parsley, mustard greens, radishes, and carrots are plucked from the newly frozen ground at Eagle Street Rooftop Farm. Novak does a seed inventory in January, ordering what she needs for the coming season, and she maps out her crops in February, spending weeks searching for the right formation. Her new seeds are beginning to grow indoors by March, around the same time hearty greens like spinach and swiss chard are growing back. The ground soil usually comes to life in April, with the warmer, wetter weather enlivening the worms, fungi, bacteria, and insects. But as we all remember, last spring brought seemingly continuous rains, causing many of Novak’s seeds to rot and the farm’s honeybees struggled to find nectar sources. Then Hurricane Irene swept through in August, completely devastating Upstate New York farms; a friend of Novak’s lost $80,000 worth of crops. Novak and her fellow farmers are looking forward and hoping for a gentler spring and a more fruitful growing season.